After spending a perhaps unreasonable amount of time at the training dummies over the weekend, and pestering some friends about deciphering the data, I've finally got a completed spreadsheet for the current iteration of each hunter spec. So I thought I'd put together an overview of each spec as it currently stands, as if it were being released today. All the typical disclaimers of course apply, most obviously, that it is not being released today, and there's a pretty good chance some of this will change before I even finish writing this. I will not be giving any spoilers to the story of Legion; this is strictly about the mechanics of the hunter class. The basic, un-nuanced version of the BM rotation revolves around using Kill Command as often as possible, which does significantly more damage than in WoD, with the addition of Hati and Jaws of Thunder (which we'll go over below). Instead of Cobra Shots and Arcane Shots to build and dump focus, we now primarily rely on passive focus regen, which has been increased to 15 focus per GCD, and Cobra Shot is now our focus dump. In addition to the baseline passive focus regen, we have a slightly improved Dire Beast, which provides a relatively minuscule amount of focus. This means we need to be a bit more proactive with focus management, as it will take a lot longer to make up for mistakes because we can't spam our focus regen. Outside of those three abilities, we of course have a lot of other abilities and talents to try to fit in, which we'll cover below. Cobra Shot - A quick shot dealing 125% weapon damage as physical damage. This ability fills the roll that Arcane Shot filled in the WoD version of BM: an instant focus dump that doesn't do much damage: perhaps better known as "filler". While the WoD version of Cobra Shot deals nature damage, and the ability this is replacing dealt magic damage, the new Cobra Shot deals physical damage (as noted in the tooltip), making the shot significantly weaker in raiding environments. Just like with WoD BM's Arcane Shot, this ability can get you into a bit of trouble if you get spam happy with it. There will be a lot of times when an untrained hunter will see they have enough focus for a Cobra Shot while everything else is on cooldown, then use it only find they don't have enough focus for the abilities they really want to use. This is accentuated more because as BM no longer has any active focus regen, but instead is relying heavily on RNG procs for more Dire Beasts. As Bendak, of Eyes of the Beast, recently mentioned to me "weird to think that using Cobra Shot too much results in way less DPS than not using it at all". Dire Beast - Summons a beast which attacks your current target, and regens 12 focus over 8 seconds. Dire Beast was presented to us (in Blizzard's Legion spec preview blog) as a replacement for Cobra Shot / Steady Shot in BM's rotation. This has turned out not to be the case. With only 12 focus generated over the course of an 8 second duration, the focus gained is barely noticeable compared to the 15 per GCD you regen passively. Even when talented for Dire Stable, the 20 focus per Dire Beast is only barely noticeable. Primarily, Dire Beasts purpose is just DPS. Over its duration, the Dire Beast will do roughly twice the damage (depending on your ratio of weapon damage to attack power, and how much haste you have) of a Cobra Shot, and it gives you something to do for a GCD that won't cost any focus. Kill Command - Your pet deals 1.632*1.5*Attack Power as physical damage. Kill Command remains largely unchanged from previous expansions. However, with the artifact weapon we'll eventually see Hati joining in on the Kill Command fun (for two thirds as much damage as our primary pet: 1.632*1.15*Attack Power), and also an extra bonus from Jaws of Thunder (which I'll go over in the artifact weapon section). One major change for KC is it now has a hasted CD. Because our GCD is also affected by haste, Kill Command will always be available to use every 5th GCD, but as we gain more haste, that will be more and more often. This ability creates what will likely be an unobtainable soft cap for haste. At 50% haste, our GCD will have reached its cap of 1 second, and Kill command will be at 5 seconds. After that we won't see significant benefit from more haste in lowering CDs. We will still see increase from additional haste in focus, autoshots and pet melees, though. Any statement about stat values at this point is primarily guesswork, but if haste does end up being better than mastery, it's very unlikely it would remain more valuable above 50%. Wild Call - Autoshot Crits have a 20% chance to reset the cooldown of Dire Beast. The tooltip to this ability was recently changed to reflect that it only works on Autoshot Crits. Before, we had hope that that was a bug, and it would eventually apply to at least all of the hunter's shots. Instead, we now have an ability that sounds kind of cool, but procs very, very rarely. If you're interested in how seldom it procs, this article gets into some of the calculations. As I mentioned, at the time I thought the autoshot-only thing was a bug, so I talk about some other possibilities there that are no longer in the picture. 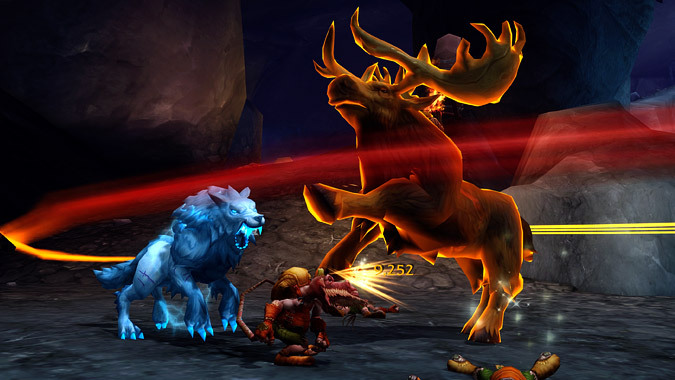 BM hunters keep their two baseline AoE abilities the same in Legion: Multi-shot and Beast Cleave. Multi-shot remains a fairly weak ability, but that's ok, as it procs an even better Beast Cleave, which does the damage of a full melee to each target, and, with the artifact trait, increases that damage to 130% a normal melee, and adds on the damage of Hati's melees, which already happen to do roughly 27.777% more damage your main pet's melees. The addition of Hati and the improved damage transfer nearly triples the damage of Beast Cleave to each target hit compared to in WoD. The reasoning for this relative increase may be the removal of active focus regen. With low Haste levels, you won't have enough focus to keep up Beast Cleave 100% of the time, in addition to using Kill Command on CD. Once you try to add in your burst AoE options, like Barrage or possibly Volley (if they ever improve its damage), deciding where to spend your focus becomes fairly difficult. Aspect of the Wild - Grants you and your pet 10 focus per second, and 10% increased Crit chance for 10 seconds. AotW is a new, baseline, damage cooldown for BM hunters, essentially doubling your passive focus regen to as much as 30 focus per GCD. This isn't enough on its own to let you spam your focus spenders, but assuming you also have a dire beast or two up, and you're weaving in Chimaera Shot, you'll be swimming in focus for the duration of this cooldown. While the focus regen is the more significant portion of this CD, the additional 10% chance to Crit of course gives you an 7-8.5% damage increase. In addition, that 10% Crit chance translates to a measly extra 2% chance to proc Wild Call during each of your Autoshots, which, well, isn't much. To give some context, if you have 40% haste, you'll have an additional 12.12% chance of getting one additional Wild Call proc over the duration of each Aspect of the Wild (you'll still have your normal chances of proc'ing WC, I'm referring here only to the added benefit of AotW). Bestial Wrath - Increases all damage you or your pet deal by 20% for 10 sec. Bestial Wrath remains the most iconic BM cooldown, but with a bit of a makeover. Instead of a big red pet, we now have a kind of orange glowing pet. In addition, with an upgraded Artifact weapon, Hati, our primary pet, and our hunter all gain 20% increased damage. However, the Focus Cost modifier is now gone (though may be returning in set bonuses or legendary items), as is Focus Fire, the 40% Attack Power buff we're used to stacking with Bestial Wrath. An interesting addition to BW is while the cooldown has been increased to 90 seconds, a new mechanic has been added which reduces the CD by 15 seconds every time you cast a Dire Beast. That means that even with no haste at all, and no Wild Call procs, as long as you use Dire Beast on CD, the longest CD of Bestial Wrath you'll have is about 36 seconds. With haste and Wild Call procs we'll be looking at CDs well under 30 seconds. Big Game Hunter - Increases the Crit chance of Autoshots and Cobra Shots by 50% against targets above 80% health. This talent will be very situational, at best. Because Cobra Shot is such a weak ability, Crit'ing 50% more often for double the damage, still isn't very much damage. The Careful Aim buff for MM currently (which increases the Crit chance of Aimed Shot by 50%) is so incredibly valuable because Aimed Shot is actually a fairly powerful shot, which also benefits from regen'ing 20 focus any time it Crits. This made spamming them against priority adds a great method for progression raiding. Cobra Shots just aren't powerful enough to really help with this sort of priority target. The only time I can imagine this maybe being useful, is if you're trying to burn through the first phase of a boss, and stacking this with Bestial Wrath and Aspect of the Wild is enough to push your team past the phase quickly. Even then, its biggest benefit is perhaps that the other two talents in this tier just aren't that great either. I suspect that this talent is kind of just left over from earlier iterations of BM hunters, where they had a lot more Dire Beasts at a time. As it is, this suffers a lot from the same problem as what we have above, even if you can manage to get 5 pets out (your main pet, Hati and three Dire Beasts), you're still only looking at 25% increased damage to an ability that does very little damage to begin with, at a large focus cost. Perhaps there will be some trinkets, or set bonuses that will make this talent more appealing. In the past, we've had set bonuses that could give us up to 5 pets/guardians at once (I'm thinking of the wind serpent from ToES/HoF, specifically), which, in addition to our regular pets and dire beasts may be enough to boost Cobra Shot into a decent damage range. Dire Stable - Dire Beast generates 8 additional Focus over its duration. This brings the total up to 20 focus every time you use Dire Beast. As I mentioned above, the focus regen is almost noticeable with this talent, though you still have to be paying pretty close attention to your focus bar to catch it. At the moment, this seems like the most likely choice from the level 15 tier. That extra focus translates into roughly one Barrage every 2 minutes, which, if timed well, may turn out to be a considerable gain. The danger of this ability is if you spend the extra focus on a Cobra Shot, which is so inefficient (when measuring damage/focus) you won't be able to do enough extra Cobra Shots to increase your DPS significantly, likely making one of the other two talents which directly increase CS's damage better choices. To put it in terms of actual in game damage: with the PvP gear we get at 110, not including any Crits or trinket procs, my Cobra Shot does 17,352 damage (against a level 113 raid boss). That's 433.8 damage per focus. That means the 8 focus per Dire Beast translates into about 3470.4 damage. Alternately, in the same situation, one Barrage does 171,614 damage (to its primary target), that's 2,145.18 damage per focus. So if I use the extra Dire Beast focus on casting extra Barrages, rather than extra Cobra Shots, this talent's 8 focus per DB translates into 17,161.47 damage per dire beast. A much more reasonable sum. Of course, in game it's much more complicated than that. If you had made a mistake, and otherwise wouldn't have had enough focus to cast a Kill Command, but this talent saved you and gave you the focus, then you're talking about an ability that does 2605.9 damage per focus, and getting even more out of it. The point of this all is to say, while this looks like the best talent choice (at the moment), depending on how well you manage focus and execute your rotation, this can be significantly worse than the other options. Stomp - Each Dire Beast will do an additional 200% Attack Power each time it is summoned. This talent essentially doubles the damage done by Dire Beasts in single target, which isn't insubstantial, and only gets better if you can hit multiple targets. To clarify, it does 200% of the Dire Beast's AP, which is 115% of the hunter's AP, and it still benefits from BM's Mastery. For some context, a Dire Beast Melee (of which the DB does 4 each time it's summoned), does 2*AP/3.5 damage, which is to say, it does 65.7% of the hunter's AP as physical damage. Each stomp does 2.3 times the hunter's AP to each target it hits. Dire Frenzy - Replaces Dire Beast; causes your pet instantly to do 5 attacks on your target, gaining 30% increased Attack Speed for 6 seconds, and generating 15 focus. This talent was presented as an alternative to Zoo-master hunter that BM is turning into. Instead of summoning random Dire Beasts from the wild, you imbue your pet with some of that Dire spirit. It works with pretty much everything that would affect Dire Beast, including Dire Stable and Wild Call. The increased attack speed makes this a particularly tempting talent for burst AoE situations, as the attack speed buff could bring you up to 3 or 4 melees within the duration of one Beast Cleave, instead of the normal 2. As we discussed above, Beast Cleave is a bit more powerful than it was in WoD, so in situations similar to the imps on Mannoroth, this could be a very important talent. Outside of the attack speed buff, this talent also lends itself well to any fight with significant pathing issues. It's likely you won't want to play BM on that sort of fight anyway, but there may be times when a pet can follow the boss if it's on them the whole time, but not if it's running from you to the boss every 12 seconds or so. Otherwise, the 5 hits of your pet are very similar in damage to the 4 hits of a dire beast, the slightly longer CD and the slightly higher focus gain of Dire Frenzy compared to Dire Beast basically negate each other. So primarily, the benefit of this talent is in the Attack Speed bonus, and just in personal preference, if you don't like Dire Beasts. Chimaera Shot - Deals 660% AP as nature or frost damage to your target and up to 1 other target within 8 yards. Generates 10 Focus for every target hit. For most people who've tried BM, this seems to be the go to talent. It's an incredibly powerful shot (does nearly double the damage of Kill Command against only one target, even after including Hati), and instead of costing you focus it generates focus. In a spec with more downtime that anyone wants, Chim Shot is a bright shining beacon of hope. I don't have anything negative to say about this ability, so I'll only say, it should be baseline. Having it in this tier makes me fairly uninterested in learning the other two talents. Even if there's a way to make Stomp or Dire Frenzy better than Chim Shot, it will take lots of careful practice and meticulous play, whereas Chim Shot you can have to put very little thought into, just use it on CD and watch your DPS increase. One with the Pack - Wild Call has a 10% increased chance to reset the CD on Dire Beast. There's not a lot to this one that I didn't already say in the section above specifically about Wild Call. It increases the number of Dire Beasts you get. Not by a lot (haste has much more affect on your total number of DBs). Especially when paired with other talents that can benefit from more Dire Beasts, this talent can feel pretty useful, and just having more Dire Beast casts to spend your GCDs on is nice. Bestial Fury doubles the base value of Bestial Wrath. If you include the artifact ability which increases the buff by 6%, you're now adding a 1.46 multiplier to every ability. BM right now is more about lots of small hits, than just a few big hits, but we've still got Chim Shot, which with the 46% increase from BW, produces some fairly amazing Crits. The biggest benefit of this talent while raiding will be for taking down priority targets. Because we have the new variable CD on BW, we may have a little bit more leeway on when we use Bestial Wrath. Saving this for priority targets could help BM get out of the rut it's been in of just being generic AoE and do all the mechanics, to instead actually doing important DPS, when it matters, to priority targets. Blink Strikes - Your pet's Basic Attack (Bite/Claw/Smack) deals 50% increased damage, and can be used from 30 yards away, teleporting your pet behind its target. Blink Strikes is back, unchanged from the WoD iteration of the talent. It's still not the most exciting talent out there, but does provide a solid damage buff, along with some target swapping utility from the teleport. While I doubt there is anyone who's willing to read through 5000 words on a spec likely isn't very close to being finished, and also isn't interested in min-maxing their character. But, just in case you're a raid leader, who may be lending advice to newer raiders, or you're the hunter in your guild that other hunters look to for advice: Blink Strikes, even when tuned slightly below the other talents in DPS, is still a great talent for anyone just getting started, or who doesn't do the best at stacking CDs or quickly reacting to procs. This is essentially free DPS, which takes virtually no management to keep up (outside of not having your pet on passive). A Murder of Crows - Summons a flock of Crows that attack your target for 975% AP over 15 seconds. A Murder of Crows is also returning as a BM talent, doing tons of damage, especially considering it's still benefiting from BM's mastery. This talent remains a good choice for single target fights, but where it really shines, is on priority adds. The largest benefit here, is unlike Barrage (which does more damage, even single target, until you get around 40-50% mastery), you don't have to spend 15-20 seconds before an add comes up, trying to save your focus while still using Kill Commands, hoping you'll get an extra Dire Beast proc. For only 30 focus, you can use aMoC, and the target dies within your 15 second window, your CD is reset, as a little bonus. Barrage - Channels a spray of shots for 3 seconds, dealing 13.6*Weapon Damage to your target, and 6.8*Weapon Damage to any other targets roughly 43 yards in front of you, in a 75 degree cone. Barrage returns in Legion as well, also unchanged from its WoD counterpart. The primary difference here will be in play style. Without any sort of active focus regen, fitting barrage into our rotation is much harder. This difficulty is mostly going to show off who has been casting too many Cobra Shots and who's been managing their focus well, as I mentioned above. Other than the obvious focus drain, Barrage remains a great talent for bursting priority targets, and providing solid AoE. Volley - Launches a volley of shots at the targeted area, dealing 3.0888*Attack Power as Physical Damage over 6 seconds. This is something hunters have been complaining about ever since the ability was removed, and Blizzard has answered your cries. Unfortunately, as it's currently tuned, there is no situation where Volley will be a better DPS choice than Barrage. The only possible exception to that from a non-DPS point of view, is if there you're in a situation where there are adds completely surrounding you, just out of range of pulling them, but close enough where barrage would hit them. Which does bring up a side benefit of Volley: if you struggle to position yourself well in dungeons, using Volley instead of Barrage will keep the other party members in your group from getting upset with you. Stampede - Summon a herd of stampeding animals from the wilds around you that collectively do 27*Attack Power as physical damage over 12 seconds. Not only does stampede do 27*Attack Power, per target. It also is buffed by BM's Mastery, and by Bestial Wrath. With the Bestial Fury and a full artifact weapon, and only 26.8% mastery, we're up to 5000% of Attack Power, per target. That's a pretty decent deal. The down side is, this version of stampede doesn't summon new pets, but instead sends waves of randomly spawned pets in the direction you're facing when you cast it. If you're turned 90 degrees to run somewhere, your stampede is completely wasted. Or worse, if your tank decides to reposition the boss after you've cast Stampede, you'll lose out on a million or more damage. Killer Cobra - While Bestial Wrath is active, Cobra Shot has a 25% chance to reset the CD on Kill Command. Because we have such a high up-time on Bestial Wrath, this talent does have some potential. If, somewhere down the line, we have enough haste, and to some extent, enough Crit (for Wild Call procs), then there may be some situations where this talent becomes worthwhile. But as things are, we only really can afford to spam Cobra Shots during Aspect of the Wild, and that's only if we're not using other high cost talents. Which brings up the primary trouble with this talent: there are too many other important abilities that we need to be spending our focus on during BW. At only 25% chance, there's just not enough focus available to be gambling on a Kill Command CD reset that you'll likely only see once every 120 focus. Aspect of the Beast - Kill Command causes the target to bleed for ~120% of Attack Power as physical damage over 6 seconds. There are more effects of this talent, but I'm going to focus on the DPS version. The tooltip for this talent isn't currently matching with what's happening in game, so it's a bit unclear what the intention for the bleed effect's damage is, but right now it's around 120% AP over 6 seconds, or 3 ticks for about 40% AP each. This is a flat damage bonus, which serves to increase the value of your Kill Command significantly. As it currently exists, this talent only seems to affect your primary pet's Kill Commands (not Hati), and it cannot Crit. Both of these things diminish the value of this talent. The primary benefit of this ability is having a buff which is up 100% of the time. If there's a fight that needs consistent DPS, instead of bursty CDs, AotB might be the right talent for it. Mostly, however, I think we'll only being seeing this talent a lot on high movement fights, when the tanks can't keep the boss still long enough to use stampede. There are no real choices as to which of the Artifact abilities you'll get, as the goal will be to unlock all of them by the start of raiding. Since there's no decision to make, I won't spend as much time on each of these, but just quickly go over what each of the DPS abilities. Hati's Bond - Introduces Hati as a second pet who always fights beside you. AP is 115% of hunter's AP. Does not benefit from Combat Experience. Focus of the Titans - Increases damage of Multi-Shot by 15%. Furious Swipes - Increases damage dealt by Beast Cleave by 30%. Beast Master - Increases attack speed bonus of Dire Frenzy by 15%. Increases damage dealt by Dire Beasts by 10% (not currently working). Jaws of Thunder - Every time you Kill Command, there's a 15% chance you'll deal an additional 50% of the Kill Command's Damage as Nature Damage. Applies to both your pet and Hati (with Master of Beasts). Master of Beasts - Hati benefits from Bestial Wrath and Beast Cleave, and responds to Kill Command. When leveling your artifact weapon, this is easily the ability that makes the single most impact on how the spec feels. Pack Leader - Increases the damage done by Kill Command by 15%. Currently, this does not affect Hati's Kill Commands. Spitting Cobras - Increases damage dealt by Cobra Shot by 10%. Surge of the Stormgod - When you use Multi-Shot, Titanstrike has a chance to discharge an electric current at your pets' locations, causing an explosion of electricity that deals 200% Ranged Attack Power as nature damage to all nearby enemies. Titan's Thunder - Discharge a massive jolt of electricity from Titanstrike into all your pets and Dire Beasts, causing them to deal 400% Attack Power as nature damage over 8 seconds. Also causes your next Dire Frenzy to deal 200% Attack Power as additional Nature damage on each of the 5 Dire Frenzy attacks. Unleash the Beast - Bestial Wrath increases damage you and your pet deal by an additional 6%. Wilderness Expert - Increases the duration of Aspect of the Wild by 3 sec. "AP" - Attack Power; equal to total agility in Legion. "WD" - Weapon Damage; use the average of the max and min weapon damage shown on artifact tooltip. "Phys." - Physical Damage; these abilities are affected by the targets armor. Calculate damage reduction as "Attacker K/(Attacker K + Target Armor)". For 110 targets hitting raid bosses (level 113), that is "7390/(7390+3474) = .680228"
"Mast." - Mastery; these abilities are affected by BM's Mastery. "H. CD" - Hasted CD; the cooldowns of these abilities are affected by haste. Calculate CD as "Original CD / (1+haste)". All BM abilities can Crit, except for two: Bestial Ferocity, which as far as I can tell just seems to be bugged (there's no double dipping possible that would indicate this is intentional) and Jaws of Thunder, which takes half the damage of a Kill Command, already benefiting from the Crit of a Kill Command, if one occurred. All BM abilities are affected by Versatility. The damage of Bestial Ferocity (applied when you have a Ferocity Pet with the talent Aspect of the Beast) is still unconfirmed, and thus does not appear on this list. It currently does roughly .397*AP per tick, which does not match spell data available. Thrill of the Taxa is a series where everyone's favorite hunter/behavioral ecologist Aukatos is going over hunter pets from a biological lens. 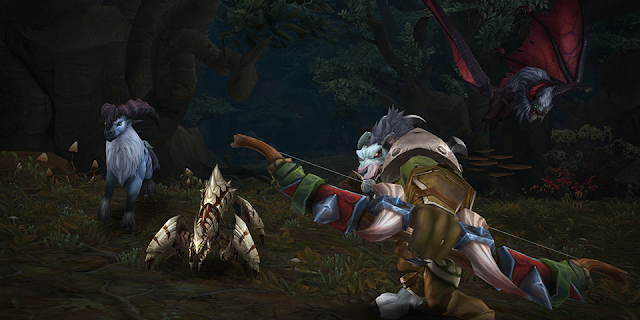 We've been working our way through some of the loosely defined phylum and classes of tamable hunter pets (and non-tamable hunter pets); this week, in his last installment (for now), Auk is covering the House Slitherin of hunter pets: Reptiles. Thanks for sticking though us for this series! Be sure to check out the earlier articles on Mammals, Invertebrates, and Birds & Dinosaurs if you haven’t already. Of course, this is a vast simplification, and missing quite a few groups – notably dinosaurs and birds. As you know from the last article, birds are dinosaurs, which are both taxonomically Archosaurs, which just happen to be one evolutionary offshoot of reptiles. In fact, many often go so far as to distinguish “avian” from “non-avian" reptiles. The term reptile covers quite a range of organisms, from the single-species Order of tuataras, to turtles, to snakes and lizards, to the crocodiles and other archosaurs we covered last time. Generally, you can divide reptiles into groups based on the number of limbs they have (four to none) and the presence or absence of a shell. All reptiles have skin that is covered with scales, whether they be thick or thin. There are several other internal distinguishing features, but the one people most recognize is that all reptiles are “cold-blooded”. In reality, reptiles don’t have blood of a lower-temperature, but they largely lack the means to regulate their internal temperature metabolically. The correct term for such a strategy is ectothermy. Ectotherms, actually, can sustain a wide range of internal temperatures. As humans, if we deviate more than 5 °F, we almost assuredly will die; some reptile species can actually tolerate being frozen (~32°F) during the winter months, while others can survive in the blistering desert heat of over 105°F! In WoW, there is a surprising lack of reptilian diversity. Not only are reptiles the least in number of all pet families, there’s a HUGE discrepancy in relation to their real life counterparts. In nature we have over 10,000 species of reptiles – in-game we have fewer than 100. To put that in perspective, that’s twice the number of mammals IRL, but less than half the number of mammals in game. Ugh. Fig 1. A phylogeny of WoW’s Reptiles by in-game family. Numbers above each family represent the number of unique looks (species) within that family. *Turtle’s taxonomic placement is currently disputed, where it could also be placed closer to archosaurs. **See the Archosaur phylogeny. 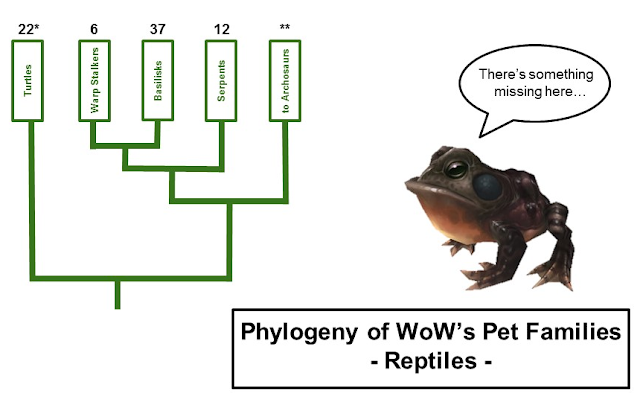 Now, we have a couple taxonomic quandaries made more noticeable by the sheer lack of families in WoW. First, IRL, turtles pose a very similar problems to crocodiles. Turtles are very ancient, having evolved alongside – but separately – from dinosaurs. Classically they’re placed as an outgroup to other reptiles, but more recent evidence would have them much closer to Archosaurs. Since we don’t know Azeroth’s evolutionary past, I’ve left them in the “traditional” placement. Second, Warp Stalkers are clearly reptilian, but where they fall in relation to a real life counterpart has me split between two very different lizards: the Tuatara versus Marine Iguana (see below). If we’re just talking looks, I think the tuatara is phenotypically closer, but their ecology is vastly different. Tuataras are smaller and terrestrial, while marine iguanas, as their name implies, make frequent dives in the ocean for food and are much larger. Since we have Warp Stalkers roaming the depths of Vashj’ir, I went with the latter, and placed them with the other lizards. Fig 2. A Marine Iguana (left), Warp Stalker (center), and a Tuatara (right). What do you think is the IRL inspiration for Warp Stalkers? There’s a snake in my boot! Reptiles have spread throughout much of the world, but one place they’re almost NEVER found are those places where it’s below freezing most of the year. The inverse is true as well, with the majority of reptile diversity surrounding the tropics. In fact, reptiles have adapted quite well to not only hot, but dry conditions. Deserts boast surprising reptile diversity, where many other animals wouldn’t be able to survive. While many reptiles are terrestrial, some have adapted to almost every habitat type on the planet. You’ll find many arboreal species of snakes and lizards high in the rainforest canopy; there are snakes that carry out nearly their entire lives underground; many turtles and snakes live in rivers and ponds; and heck, a few have even evolved strategies to deal with the extreme salt of the ocean! In Azeroth and beyond, most of the reptile placement is fairly reasonable. Blizzard likes to play heavily on desert and jungle themes, so you’ll find basilisks and serpents throughout. However, Blizzard seems to think that almost all turtles are aquatic. In WoW, most of the places you’ll find turtles are near water. While there is sizeable diversity among aquatic turtles in real life, there are also many that are terrestrial. I’m fairly certain the turtle family in-game started was inspired by snapping turtles, but has since *evolved* over the course of a few expansions (ancient turtles, dragon turtles). Why not place some box turtles in the forest, or some tortoises deep in the desert? Fig 3. The first turtles I remember running across in my WoW career were these Snapjaws. 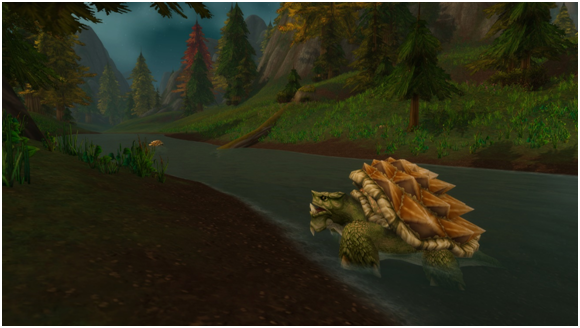 Common snapping turtles IRLcan tolerate a wide range of temperatures and can be found in temperate regions like Hillsbrad represents. Reptiles can be carnivorous (all snakes, many lizards and turtles), omnivorous (many lizards and turtles), or herbivorous (a few lizards and turtles). I hesitate to say reptiles are strictly herbivorous, because an iguana or tortoise may accidentally get an insect while munching on leaves, or opportunistically grab something if their diet is lacking in some nutrient or mineral. Here, Blizzard hit reptile diets pretty spot on! In-game, all reptiles can eat meat and fish, with warp stalkers and turtles being able to eat fruit, and turtles further being able to eat fungus and bread. In real life, reptiles largely live solitary lives but can congregate at special times, such as breeding seasons or plentiful food patches. Sure, they beef over turf, like in many lizard species, but there’s really no social hierarchy like we see in mammals, or division of labor like we see in invertebrates. You might happen across a line of turtles going down the shoreline of Tanaris, but that’s probably just the path of least resistance from one food patch to another, and it just so happens several turtles are hungry at the same time. This happens in real life, so again, I can’t fault Blizzard for this either. Something that does bother me is the way the Serpent family models are designed. In the real world, snakes can’t sustain an upward body posture – it’s just too energetically expensive. In fact, the only times snakes rear up like the models in WoW are for only the most extreme of circumstances, like intimidating a predator or battling another make for mating rights. In-game, there are plenty of serpent models that are more realistic to real-world snakes, such as the elite Marsh Anacondas in (WoD) Nagrand. Why these haven’t been incorporated into the Serpent family is a mystery to me. Basilisks are really misunderstood. When they’re not guarding the Chamber of Secrets, they’re existing in the real world as lizards. In addition, they seem to have traded their fabled ability to turn people to stone for a different fabled ability – to run on water! It’s true; Basilisk lizards can run in short bursts, and have such a great surface area on their hind legs that they can run across short distances of water in pursuit of prey or fleeing predators. This feat has earned them the nickname, “Jesus Lizards”. Turtles have Shell Shield, which is a pretty literal take on their IRL abilities. While not all turtles can withdraw into their shells fully (side-necked turtles), the presence of a shell itself is often defense enough. Good job Blizzard, while not terribly creative you did hit the nail on the head here. Warp Stalkers have Warp Time. Since this family isn’t an exact copy of a real-world reptile, I won’t count off too many points for having such a fantastical ability. It is pretty cool, although I preferred the Blink they had a few expansions ago. I wasn’t the hunter whose pet blinked through a wall and accidentally pulled Gruul and wiped the raid… that was… some other hunter. Basilisks, like Warp Stalkers, are more fantastical than realistic. However, unlike the prior family, “basilisks” do exist IRL. Given the AMAZING abilities they display, I’m a little sad Blizzard didn’t play more heavily to something water-walking related (think like the glyphs Rogues have that lets them sprint across water). Finally, Serpents have the creatively-named Serpent’s Cunning. Now, maybe it’s just me, but I think if there ever was an easy family to create an in-game ability for, its snakes. Constriction? Nope. Venom? Nope. There’s definitely a lot of love that out legless pals need in Azeroth and beyond. The “Elephant” in the Room. I’ve touched on a sensitive matter a few times throughout this article. It’s an issue very close to my personal interests, but is something a lot of people overlook when it comes to pet families. More specifically, the taxonomic diversity. Most specifically, the LACK of one entire Class of animals IRL: Amphibians. Amphibians IRL have about as many species as reptiles and mammals combined, not to mention making up the critical evolutionary link to nearly all non-fish vertebrates. 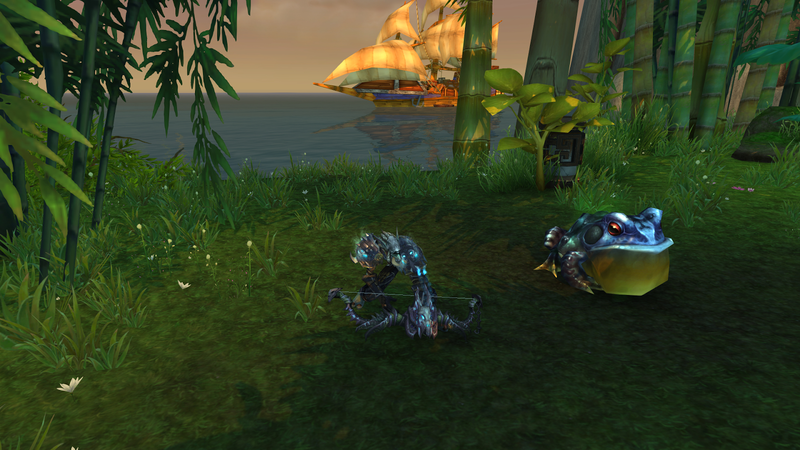 So, why have we not seen ANY Amphibian pets in WoW? You tell me! (No, really. Why do you think it is?) IMO, there’s plenty of lore that Blizzard could have drawn upon for fantastical amphibians – newts and toads are often mentioned in magical recipes, salamanders were thought to be beings of fire, the transformation from tadpole to frog is symbolic for rebirth in some cultures, amphibian’s association with water is seen by some as “cleansing” or “healing”… I could go on. If Blizzard can recolor a Basilisk model nearly 50 times, surely they could retool it for a salamander model as well. Seriously though, why so many Basilisk skins? It would be one thing if it was a monumental effort to design a new NPC from scratch, but there’s clearly a template available for salamanders. For those of you that are familiar with Caecilians, another group of amphibians that resemble worms, the existing worm models that could be reskinned for those too! And then there’s Gulp Frogs. Blizzard actually has an amphibian in game, complete with a fairly-updated model (Pandaria, if I recall), battle animations, and at least a couple different color variations. Heck, there’s even battle pet frogs! What would look cooler than waging war alongside the Hypnotoad?! I can’t think of much. Fig 5. Seriously, how cool would this be?! Battle Toads anybody? 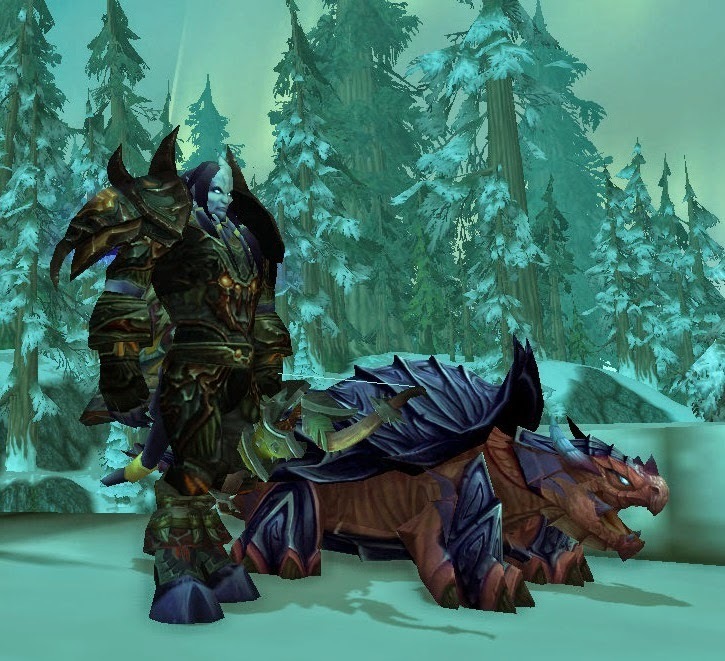 There are a few other issues Blizard could implement with reptiles, such as the Serpent models, or curious abundance of Basilisk colors, but none so important – or drastic – as the lack of amphibian availability as hunter pets, and their representation in WoW as a whole. Three heads are better than two! Although there aren’t any Amphibians, we do see a couple other families in WoW that are more mythical than a representation of a real-world reptile. Hydras have been a staple of mythology since Ancient Greece, and are most certainly of reptilian nature. There were several new Hydra models added to WoW with Warlords, not to mention Chimaeron! Wind Serpents are fictional and reptilian. While there are snakes that can expand their ribs to glide from the tops of trees to the ground, avian reptiles are the only members of this evolutionary tree that can sustain self-powered flight. Wind serpents really cool nonetheless, and in need of a model update. Now, I’d wager Sporebats are ectothermic. Does that make them a reptile? Who knows? If you ask me, I’d say they’re closer to an amphibian! Well, we’ve reached the end of our crash-course through the ecology, taxonomy, and behavior of a hunter’s most cherished companions. I’ve had a blast sharing some of my perspectives through the lens of a MMO-loving biologist, and I hope you have enjoyed them as well. Heck, maybe you even learned a thing or two! Just remember, the next time you’re venturing forth in Azeroth, and see a tickbird on a shardhorn, or perhaps a silkworm and a moth, or see a cat take down a goat, think of where it all came from. While WoW is fantasy, they have a great team that uses the real world as inspiration. Open up an internet tab and look it up – you might just be surprised by what you find! I guess the off season is over, and I need to start working out my liver, get ready for the massive amount of drinking that is Blizzcon. Blizzard has now officially announced another Blizzcon to start planning for. I'm still up in the air as to weather I'll make it again this year, anyone have plans set up? Houses you've got your eyes on? I have no idea what they might be announcing at this year's blizzcon. Maybe WoW2? Surely not a new expansion, though it'll be weird having two Blizzcons in a row without a WoW xpac announcement. Of course, Overwatch will be in full swing, and I'm looking forward to seeing what the competitions for OW are like. I think I'm mostly excited about the e-sports aspect of the con. I really enjoyed Heroes of the Dorm this year. And hearthstone has always been surprisingly fun to watch, as long as they have good casters. Anyhow, assuming I'm going, I'll be looking forward to seeing a lot of you there! One of the biggest changes to the way we'll be playing in Legion comes from the new legendary item system. Random drops around the world will give you a chance to pick up one of many "legendary" quality items. These new legendaries have high item levels, and include an extra ability, which we're told will be of similar power level to the 2 or 4 piece set bonuses we're currently used to. These have not been tuned at all, as far as I can tell, so don't get your hopes up too much if you see a combination that will make you invincible. The devs have mentioned a couple times now that after tuning, none of the legendary items will be so powerful as to render the wearer unkillable, or double their DPS. Essentially, when equipped you can place double the number of traps, as long as you place them on concurrent GCDs. That is, if you place an Explosive Trap, the CD will have a 3 second buffer before triggering, in which you can place a second Explosive Trap. The way SV's rotation is working at the moment, you have some intense moments where you're trying to using all of your Mongoose Bite stacks while the buff remains, and then you have some down time while you're waiting for the stacks of Mongoose Bite to rebuild. So basically, with this item you'll have something to do in those GCDs, and we've been told (for whatever that's worth) that at least Explosive Trap will be powerful enough that we'll want to use it, even in single target fights. Gives you 30 focus every time a trap is triggered. The current (for the last couple seasons, actually) set bonus from PvP gear gives you a very similar bonus, but this one should be much more valuable, since traps supposedly will no longer be just for crowd control, but should be an integral part of your rotation. Since SV doesn't have any but passive focus regen, this could become fairly valuable, especially when paired with Nesingwary's Trapping Treads, which would end up bringing you from 0-10 focus to 90-100 focus in 2 GCDs. "Your Marked Shot always hits your Currently selected target in addition to its normal targets, even if not affected by hunter's mark." This is a deceptively powerful ability, as it at the very least doubles the damage done of your Marked Shot, which is already a fairly powerful ability. If you add in the benefits of using it while target swapping, with the Patient Sniper or Heightened Vulnerability talents, you've created a huge cleave burst, on demand, with no need to rely on Hunter's Mark RNG. You heal for 20% of your maximum health every second when you have feigned death. I think it's safe to assume this is one of those abilities blizzard was talking about when they said they wouldn't go live with any legendaries that would render the wearer unkillable. Flavor text on this is a quote from Vol'jin, after he survived Garrosh's assassination attempt: "If dey want to kill me, dey betta' kill me dead. They betta' kill me da first time. They betta' kill me in my sleep." Even without the "every second" portion of this, it would be fairly powerful to have a 20% heal every 30 seconds. We also have to remember that we'll no longer have our 2 charges of deterrence, but instead will have one charge of Aspect of the Turtle on a 3 minute CD. So any hope of casting Deter then Feign Death to guarantee a return to full health is unfortunately squashed, as we'll have to be much more stingy with our AotT usage. One thing that continually annoys me about blizzard's cross-expansion game design, is they often will take nerf or take away abilities at the end of an expansion, and then give them back to us as a "reward". This is the surest sign that they're just out of ideas. Anyhow, this belt serves to return (at a greatly nerfed rate) the focus cost reduction we currently have with bestial wrath. When equipped, all abilities cost 20% less focus during Bestial Wrath. This is important for a fairly focus starved spec like BM. I'm not trying to say this isn't a worthwhile bonus. It just annoys me that we're supposed to get excited about being an ability being nerfed. Each enemy you hit with Multi-Shot increases the damage of your next Aimed Shot by 10%, stacking up to 20 times. 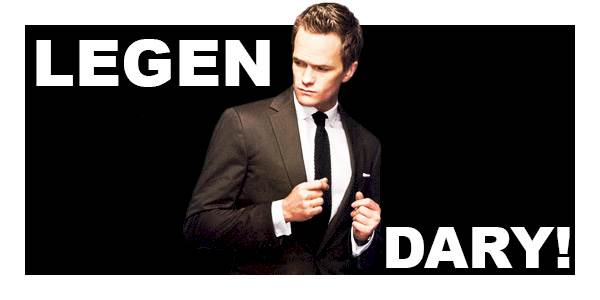 I don't know how to make clear how awesome this is. Aimed Shot, an ability that does 250% weapon damage, which is buffed by 150% or 175% (depending on talents) almost passively, and which has an extra 15-25% crit chance from our artifact, will now do up to 200% more damage, based on using Multi-shot, an ability which doesn't cost, but builds focus. You know all those times your raid leader said to focus a target, not to spam AoE? Well forget about it. Spam that AoE until you're at full focus, then dump some Aimed Shots on your priority target for more priority burst than any spec in the game. This pairs very well with Lone Wolf and the yet-to-be-named legendary which lets you cast Marked Shot without first getting a Hunter's Mark proc. Based on the tooltip, this doesn't sound like the most exciting ability: "The first time Harpoon hits a target, your damage done to the target is increased by up to 30% for 8 seconds, based on your distance form the target". "The first time harpoon hits a target" means this isn't really going to be useful for overall damage against a boss, but instead, the purpose of this legendary is to increase your on demand damage to priority adds. The problem is, there's really very little chance that this will be enough to make you better at bursting priority targets than SV's ranged siblings, primarily MM. There are some fights where there are too many ranged mechanics for priority target bursting, where a melee like SV could thrive with this ability. Primarily I'm thinking of Mythic Gorefiend, where you could harpoon out to the Essences, and harpoon back to finish off a Corrupted Soul (with the added benefit if anyone went into the belly while out of place, giving you the max range harpoon opportunity), or put some burst damage on the big tank add. Still, I'm not excited about an ability that will encourage me to run away before harpooning toward someone. Depending on how this legendary's ability will scale with distance, that might be the only way to get the most damage out of it. BM and SV will both have extra bonuses from this legendary, as both have major offensive CDs that are aspects, Aspect of the Wild and Aspect of the Eagle, respectively. The tooltip for these boots reads: "Dire Beast reduces the cooldown of Kill Command by 3 seconds". I think it's safe to assume this means each time you cast Dire Beast, not for the duration of Dire Beast. I'm not sure how I feel about this. It's not the most exciting ability, and a lot of BM mechanics are already tied to Dire Beast, but, more Kill Commands is never a bad thing, I suppose. One of the kind of odd benefits of this, is you'll have an easier time making sure you always can cast 2 Kill Commands during Bestial Wrath (getting the most out of the damage increase), because most of the time, Bestial Wrath will be coming off CD immediately after casting Dire Beast (which reduces the CD of Bestial Wrath by 15 seconds per DB cast). That means, the most CD you'll ever have left on KC after casting Bestial Wrath (assuming you cast it the GCD right after casting DB) will be 1.5 seconds, giving you plenty of time to always get off a second KC during BW. Every damaging ability you cast reduces the CD of Trueshot by 1 second. Combined with the Marksmanship 4 piece set bonus (which, as it currently stands, reduces the CD of Trueshot by 1 second for every 20 focus you spend) we'll be seeing a lot of Trueshot usage. There's not much complexity to this one, and it may feel a bit lackluster since it is incredibly similar to one of our set bonuses, but it should still be a significant DPS increase, and it will give us more opportunity to use Trueshot as needed, instead of using it on CD regardless of phase or priority targets. This is essentially a watered down version of the current Adaptation talent, giving your pet the passive abilities of tenacity, cunning and ferocity specs. Unfortunately, passive abilities means it's leaving out some the most desirable abilities, like Last Stand, Bullheaded, Roar of Sacrifice and Heart of the Phoenix, which I'm assuming will remain spec only. That's not really a problem, as the only times I would really like to have all of those abilities would be fore extreme soloing. Still, the ring would feel much more "legendary" if it included those on-use abilities as well. This is kind of a weird item, that appears to be usable by all specs (from the datamining, at least). It gives you an absorb shield equal to 30% of your maximum health for 30 seconds, any time you go 5 seconds without taking any damage. In raiding, a lot of the time when this could be really useful will be during phases where there's too much raid wide damage to ever get the shield up anyway. Though I can imagine some situations where you'll be able to perhaps cheese a soaking-type mechanic by using this and a mild damage reduction. So there could be some points where it's fairly useful. I'm also really curious how this will affect PvP. If this is a prevalent item that lots of people have, I imagine it will make DoT classes/specs much more valuable, as if you aren't playing against a dot class, you could hide behind a pillar for a few seconds and get what's essentially equal to a 30% heal. While standing still, you heal for 5% of your max health every 5 seconds. That's... something. Really, it's hard to care about any healing compared to 20% every second while feigned death. While some passive healing is nice, this is only 1% of max health more than Spirit Bond currently gives us (which will be gone in legion), so like several others, this legendary doesn't exactly feel legendary.